Originally known as the Museum of Manufacture, the Victoria and Albert Museum (or V&A Museum, as it is popularly known) in London is a veritable treasure-trove of artefacts from cultures around the world. Devoted to art and design, it houses about 2.3 million works, including paintings, photographs, sculptures, textiles, furniture, metalwork, ceramics and fashion going back 5,000 years. The V&A Museum also hosts regular family activities and workshops, and has an on-site sculpture garden. 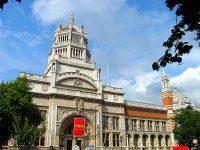 A must-see tourist attraction in London, the Victoria and Albert Museum is a wonderful place to spend an afternoon, poring over fascinating items and learning more about the world's cultural bounty.